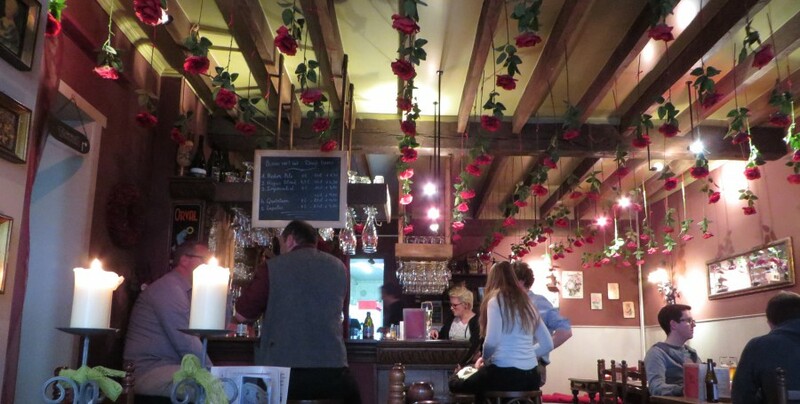 While in Antwerp we visited Kulminator: a lovely bar which specializes in matured beers. Their beer menu is huge, and many of the beers have a variety of ages listed: the older they are the slightly more expensive they get. Wanting to try something different but not splurge too much I went for a 12 year old Westmalle Dubbel (2003). Carl ordered a matured Orval. 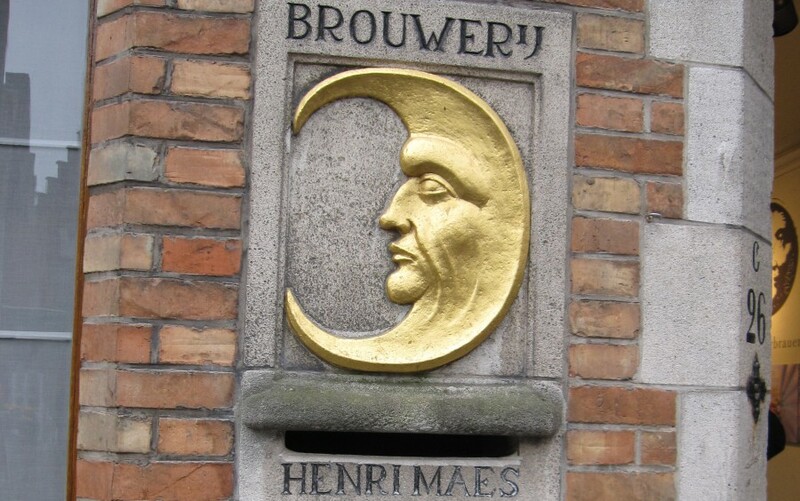 All the matured beers are kept in a variety of cellars so it took a little while for the sweet older owner to go and retrieve our orders, which apparently were in SEPARATE cellars! 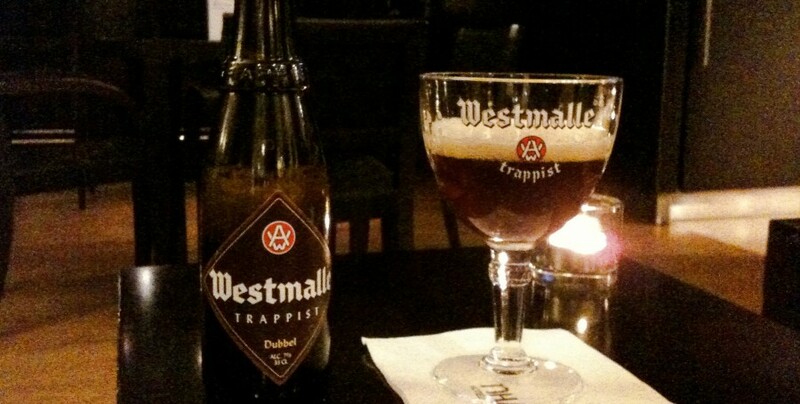 The Westmalle Dubbel is a popular dark Belgian trappist beer with an alcoholic volume of 7%. It has been brewed by Brouwerij der Trappisten van Westmalle since 1926, who also brew (unsurprisingly) the Westmalle Tripel and Westmalle Extra. The Dubbel is presented in a dark brown bottle with a diamond-shaped chocolate brown label. It is usually served in a 330ml bottle, but can also be found in larger 750ml bottles and sometimes on tap too. The Westmalle Dubble pours a lovely deep reddish brown colour with a lovely big beige head. A light smell of malt, yeast and fruit. Faint tastes of caramel and dried fruits. It’s not too heavy in taste and is quite smooth, but also slightly tart. The taste develops slowly into a dry, slightly spicy lingering aftertaste which is quite pleasant. I would rate the Westmalle Dubbel a solid 7 out of 10. Not my favourite beer but still pleasant and enjoyable to drink. The bottle I received was from 2003, with a best before date of 3rd February 2006. It was in near perfect form (as opposed to the dusty, dirty 2006 Orval that Carl had ordered!) and if I hadn’t known what I’d ordered I wouldn’t have suspected it was a vintage! Having now refreshed my mind with the appearance if it’s contemporary, I can now see that although the bottle is unchanged and the label is similar, the vintage label is square as opposed to diamond shaped, and the layout has been altered to suit the different shape. The vintage Dubbel pours much the same colour- possibly darker but that could have just been my imagination. The large frothy head has pretty much disappeared and immediately the smell of the beer is intenser and much more treacly. To taste the vintage beer is much thicker. The overwhelming flavours are treacle and liquorice, with the caramel and fruit taking a step into the background. Syruppish is the word that springs to mind,if that’s even a word. The flavour doesn’t linger for so long either. I’m surprised how different a beer can become when the only added ingredient is time. Simultaneous to this feeling, I can still tell the beer is a Westmalle Dubbel: it’s not completely different… like it has the same basic flavours, they’ve just been rearranged and given different priorities. I was surprised by the vintage Westmalle Dubbel, possibly even a little taken aback, but after a few sips realised I quite liked it. I would rate the aged Westmalle Dubbel a treacly 8.5 out of 10. 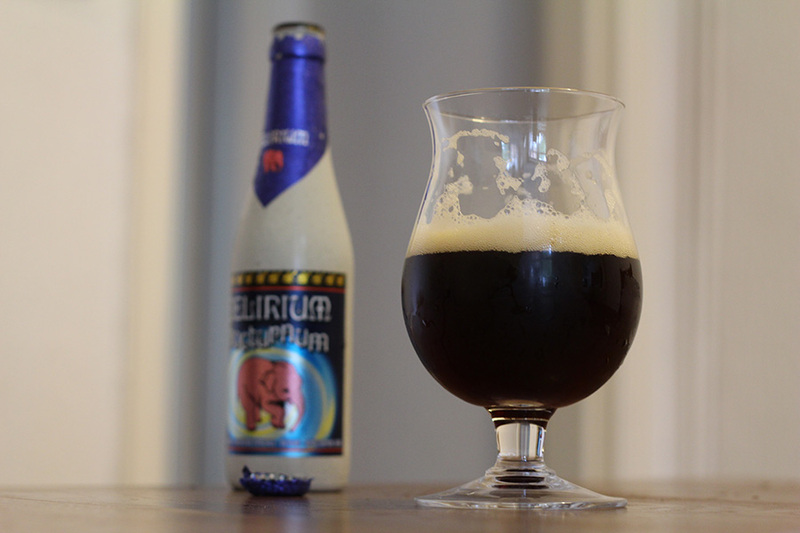 Our first beer review is of Delirium Nocturnum – a dark beer 8.50% ABV – from Brouwerij Huyghe of Melle, a few miles South East of Ghent in East Flanders. Bottle is the usual 330ml. We’ll both be reviewing the beer and giving it a score out of 10. I like the logo with the Delirium brand. 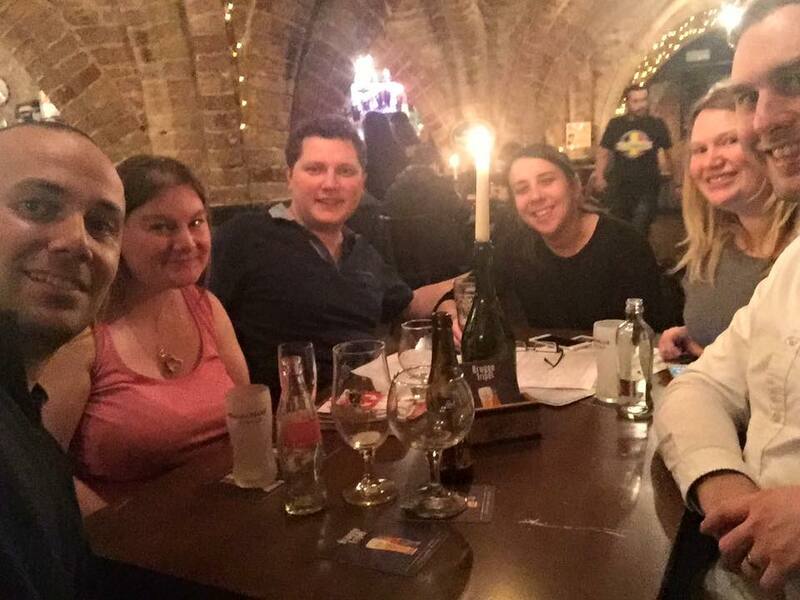 It reminds me of the first time we went to Belgium for a surprise New Year trip to Bruges and, not really knowing where we are or where to go, we ended up in an Irish Bar just off Grote Markt. At the time I had no idea that the iconic pink elephants had anything to do with a brewery, I just liked the pretty pink elephants all over the ceiling of the otherwise fairly average bar (with fairly grim toilets if I remember correctly). Presentation is unusual in the fact that the bottle is painted an off-white colour with a bright blue almost trippy label and foil to the neck. This is a whole new level of making a beer stand out on the shelf! I can’t imagine many men wanting to be seen with that bottle though, which makes me look forward to tasting it, knowing the brand has stood the test of time. Pouring the beer pleases me: I like my dark beers and this one doesn’t disappoint. It’s a very deep red colour with a beige head which disappears pretty quickly. It looks quite syrupish. The smell is hardly noticeable at all even with my nose right next to the liquid. The Delirium Nocturnum is, to me, a pretty complex beer to taste. The first thing I think when I taste this beer is fruity, but that taste disappears pretty quickly to reveal a bitter chocolatey flavour, which in turn again disappears after a few more seconds to leave a sweet, deep but refreshed after-taste which continues to develop for a good 30 seconds after I’ve swallowed the beer. It’s fizzy, but that doesn’t last long in my mouth. 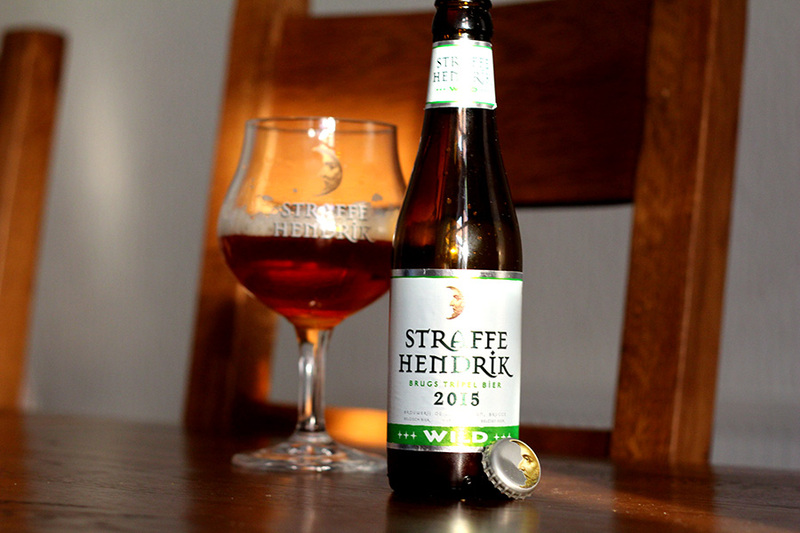 I like it, and I find the complexity enjoyable, but it’s not a beer I’d drink regularly. I’d give this a solid 7.5/10. This is a beer we’ve often seen but were yet to try. The other Delirium beer I’d tried had been a couple of bottles of the 10% Delirium Noël over New Year in Ghent – so I decided pick up 8 bottles of this to sample. 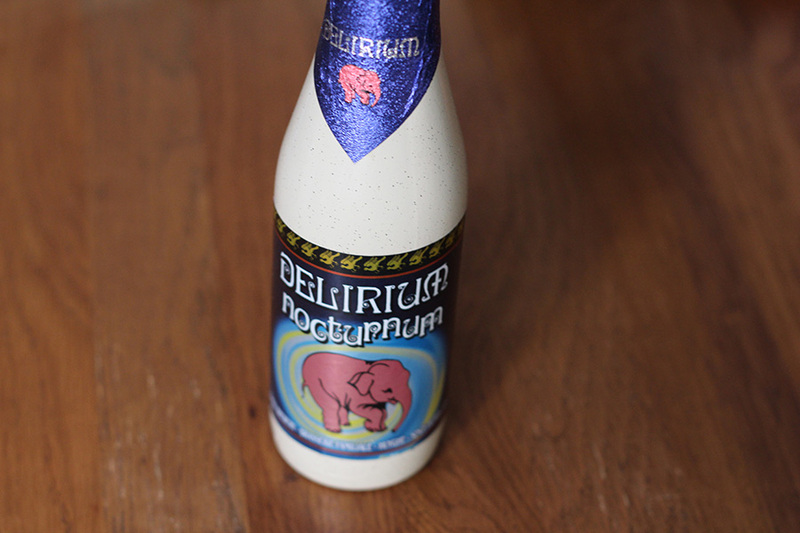 Helen has previously discussed the bottle and the infamous “Pink Elephant” so I won’t really go there apart from to say that the Delirium brand is certainly a strong one. 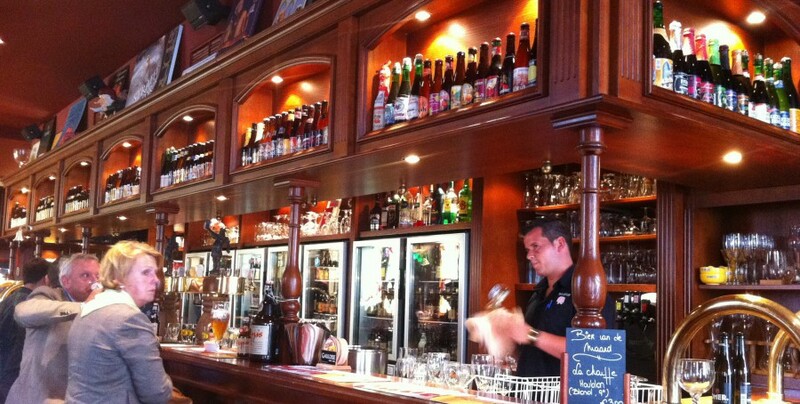 As well as the beer, Delirium Café franchises can be found as far away as Tokyo and Brazil. On to the drinking… the first thing I notice is the a fruity taste with quite a strong alcohol feeling in my throat. I’m thinking this would feel great on a cold winter’s evening. The initial fruity-alcohol hit gets momentarily sweeter and then dissipates leaving a lingering taste of caramel. The texture seems slightly watery – for want of a better phrase! Very drinkable – it never feels heavy. Overall I like this – a good winter warmer, although could be drank at any time. I’d rate this at 8/10.